The Jeep Renegade reviews show that Regina and Moose Jaw drivers are not the only ones stunned by what it can offer. A crossover that can truly be said to excel equally in the city, on the highway, and traversing the great outdoors, it thoroughly outperforms competitors like the 2015 Honda HR-V, the 2015 Chevrolet Trax, the 2015 Nissan Juke, and the 2015 Kia Soul. The 2015 Jeep Renegade starts at just $19,995. Fitted with either a 1.4L MultiAir Turbo I-4 or 2.4L Tigershark MultiAir I-4 engine, the base Sport model offers a Uconnect 3.0 multimedia centre with 4 speakers, steering wheel-mounted audio controls, and an advanced brake assist button. 2015 Honda HR-V: The HR-V’s LX 2WD model starts at $20,690. 2015 Chevrolet Trax: The Trax’s LS FWD model demands at least $20,880. 2015 Nissan Juke: The Juke’s SV FWD model starts at a minimum of $20,498. 2015 Nissan Juke: The Juke provides 1,007 mm of headroom in the front and 933 mm in the rear. 2015 Chevrolet Trax: The Trax offers 1,006 mm of headroom in the front and 986 mm in the rear. 2015 Kia Soul: The Soul allows for 1,006 mm of headroom in the front and 1,003 mm in the rear. The 2015 Jeep Renegade’s expansive cabin also ensures that you’ll always have plenty of space in which to stow cargo. Fold down the rear seats and you’ll be able to take all your larger outdoor toys, or even help out with a move. There’s up to 1,438 L to play with — a best-in-class rating. 2015 Nissan Juke: The Juke provides up to 1,017 L of cargo space. 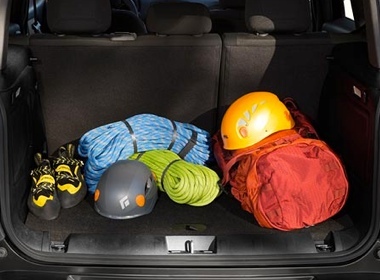 2015 Kia Soul: You’ll find 1,402 L of cargo space in the Soul. Impressive, but less than what the Renegade offers. 2015 Chevrolet Trax: The Trax allows you to fit up to 1,371 L of cargo with all seats folded down. 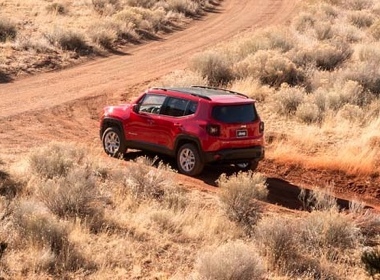 As a Jeep, it should come as no surprise that the 2015 Renegade offers Regina and Moose Jaw drivers the exceptional performance necessary to conquer the backcountry with ease. The choice of 4×4 systems is a testament to that fact. Unlike the 2015 Nissan Juke, the 2015 Chevrolet Trax, and the 2015 Kia Soul, you’ll be able to choose from two: either the Jeep Active Drive or the Jeep Active Drive Low with 20:1 crawl ratio. Both are fitted with a Class-Exclusive rear-axle disconnect system that powers only the front wheels when 4×4 traction is unnecessary, allowing for improved fuel economy. They also come with an integrated Selec-Terrain system with modes for Auto, Snow, Sand, and Mud — plus Rock when you drive home in a Trailhawk model. You’ve Seen the Jeep Renegade Reviews — Now Drive It! The Jeep Renegade reviews make it clear that this crossover offers more space for both passengers and cargo, a greater selection of 4×4 systems, and a lower price than its competitors. Test-drive yours near Moose Jaw at Crestview Chrysler in Regina, SK.